Park Alert . . .
Water has shaped the stories of this landscape from the beginning. Around 110 million years ago, during the Cretaceous Period, water brought dinosaurs here. Two kinds of ancient giants left their tracks on what was a beach, along the Gulf of Mexico’s early reaches. 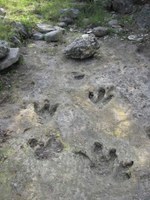 Today, you can take a strenuous hike to a creek bed to see tracks. Scientists believe these are tracks of theropods, three-toed, two-legged animals who ate meat; and much larger sauropods, round-footed, four-legged animals who ate plants. Much later, Native Americans passed through the canyon, often camping near springs. Still later, European immigrants began exploring the canyon’s floodplain area, looking for minerals and rich soil. The clear springs, fertile floodplains and lush grasslands sup­ported farming and ranching in this area from 1860 until fairly recently. Families like the Hoff­manns, Zizelmanns, and Kallisons depended on the supply of fresh water to support them­selves and their livestock. In the early 1850s, government surveyors laid out a military supply route through this area to western forts. Military personnel from Fort Sam Houston blazed the road. The Joe Johnston Road, as it was known, ran from San Antonio to Bandera. The locals’ nickname for the project – the “government road” that was being built through the “government’s canyon” – stuck. We call it Government Canyon to this day. San Antonio’s dependence on the aquifer’s fresh water grew with the city’s population. Locals became concerned about develop­ment over the aquifer’s Recharge Zone in the 1980s. Water began connecting people around a common cause. Civic and environmental groups formed the Government Canyon Coalition in 1991. 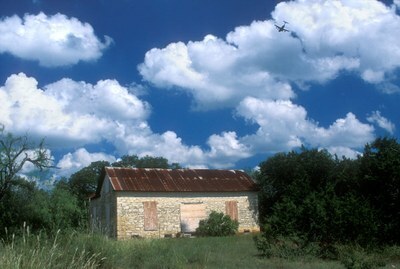 The groups hoped to buy the property and protect it from development. A state natural area was about to be born. Government Canyon State Natural Area protects 12,244 acres in northwest Bexar County. Texas Parks and Wildlife De­part­ment began purchasing the land in 1993. Partners included Edwards Aquifer Authority, San Antonio Water System, the Trust for Public Land, City of San Antonio and Bexar County. The Natural Area opened on Oct. 15, 2005.